Maureen Konopka, Director of Music Ministries, plays piano. As a professional musician, Maureen Konopka has always been a bit of an anomaly within her family. Her father worked for the post office. Her mom is a pharmacist. Her sister works in human resources. And her husband works in information technology. Amid all those left-brain types, Konopka’s creativity continues to make her stand out. Konopka grew up in the Dormont neighborhood of Pittsburgh and has been playing piano since age five. She graduated from Indiana University of Pennsylvania with a B.S. in Music Education. Following graduation, Konopka taught high school and middle school music for six years in Dorchester County, Maryland. While there, she met her husband Eric and started their family, which now includes Sam (ten) and Allison (seven). In 2013, Konopka returned to Pittsburgh to be closer to family. 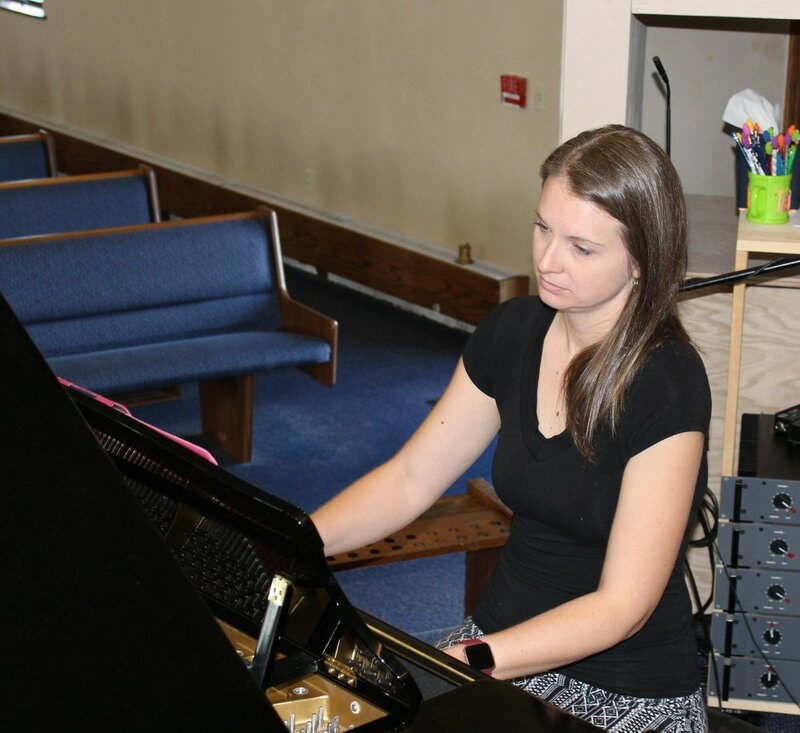 After teaching at the School of Rock in Wexford and serving for three years as director of music at Wexford Community Presbyterian Church, she joined the Dutilh Church staff in January 2018 as director of music ministries. Konopka said her profession is truly a calling, and that her current role is a response to God’s call. The best thing about her role, Konopka said, is the sense of fellowship. She sings alto and plays clarinet, saxophone, trumpet, trombone, guitar, and steel drums as well as piano, but piano remains her instrument of choice. In her relatively short time at Dutilh Church, Konopka has likewise transformed the music ministry. When she arrived, the Chancel Choir had four members. Today it has 18. She attributes that success to a special camaraderie shared within the group. “We joke, we laugh, we tell stories during rehearsal,” Konopka said. Konopka’s welcoming approach draws in new members; the positive environment helps keep them there. Konopka said one of her most rewarding moments in music ministry was the choir’s work on the 2018 Christmas Cantata. The effort required extra weekly rehearsals and learning four-part harmonies. Many of the choir members took it upon themselves to rehearse independently at home, Konopka said. Looking to the near future, Konopka is most excited about the Easter Cantata, set to take place on Palm Sunday, April 14, at the 11:00 a.m. service. Her enthusiasm is contagious and her face lights up as she describes it. “It’s going to be so good!” Konopka said. “The last song is called ‘On the Third Day’ and we have an introduction with handbells and then Elizabeth Franklin is going to sing this haunting solo. It’s amazing!” Konopka said the Cantata includes many vocal solos as well as music from the Dutilh Handbell Choir and the special Cantata Orchestra. Outside of her part-time work at Dutilh, Konopka owns her own piano lesson business, Cranberry Learns Piano. She likes all kinds of music, and her iPod currently has—in addition the this year’s Easter Cantata—everything from the soundtrack of Les Misérables to bands such as Fall Out Boy, Simple Plan, Third Eye Blind, and Hootie & the Blowfish. Anyone interested in getting involved with music ministry at Dutilh Church should contact Konopka at music1@dutilhumc.org. Or just catch her after the worship services one day. She’ll be the one dancing on the altar as she plays the keyboard.